Hooray for simplicity! Brooklyn pioneers Andrew Feinberg and Francine Stephens prove repeatedly that food doesn’t need to be complicated to sing. The rustic Southern Italian recipes in Franny’s are what home cooks want. 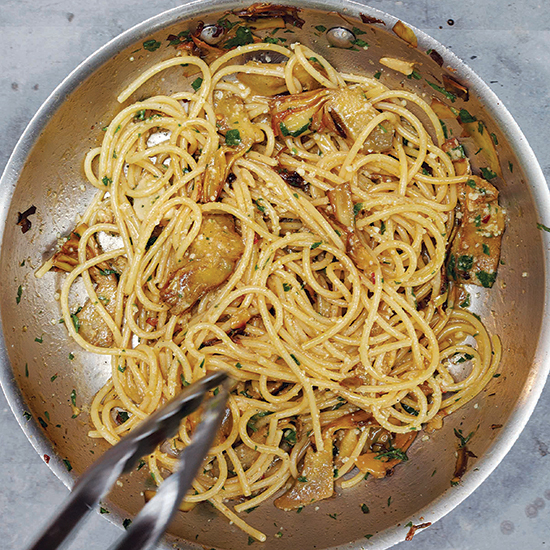 A perfect example: this spaghetti with fresh artichokes in a tangy, spicy, garlicky sauce. It’s classic but unforgettable. The flavors in this recipe are very Roman: a combination of artichokes and Pecorino Romano, along with chili, garlic, and parsley, is something you’d see in a trattoria in the Eternal City. We like the addition of the softer Parmigiano-Reggiano, which imparts a milky creaminess to balance out the Pecorino’s piquant saltiness. 1. Halve the artichokes lengthwise, then slice lengthwise into 1⁄4-inch-thick slices. In a very large skillet (or a Dutch oven), warm the olive oil over medium-high heat. Add the artichokes, garlic, and salt and cook until the artichokes are nicely browned and a little soft and the garlic is golden around the edges, 6 to 7 minutes. Add the chili flakes and cook for 1 minute. Add the water (just enough to not quite cover the artichokes) and let simmer until the artichokes are very soft, about 2 minutes. There should still be some liquid remaining in the pan. Remove from the heat. 2. Meanwhile, in a large pot of well-salted boiling water, cook the pasta according to the package instructions until 2 minutes shy of al dente; drain. 3. Toss the spaghetti into the skillet with the artichokes, along with the parsley, Parmigiano-Reggiano, butter, and pepper, and cook until the pasta is just al dente, 1 to 2 minutes, adding 2 tablespoons water if the sauce seems dry. 4. Divide the pasta among four individual serving plates or bowls and finish each with a drizzle of olive oil and a teaspoon or more of Pecorino Romano. Excerpted From Franny's by Andrew Feinberg, Francine Stephens, and Melissa Clark (Artisan Books). Copyright © 2013.